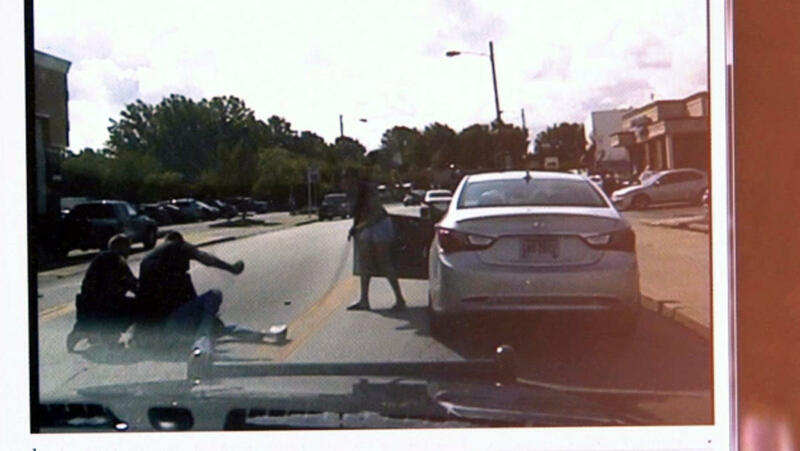 EUCLID, Ohio -- Suburban Cleveland police have released dashcam footage of a violent arrest after witness video of the incident went viral, CBS affiliate WHIO-TV in Cleveland reports. In the dashcam footage, a police officer asks a black suspect to "face away" from him twice before kicking and taking the man to the ground. Two officers can be seen struggling to subdue the suspect while a woman appears to plead with the suspect. One officer begins punching the man and hitting his head against the pavement. "He don't got no gun on him," the woman screams in the video. "Stop hitting him!" In a statement, Euclid police said the suspect, 25-year-old Richard Hubbard III, ignored police orders to turn away so officers could place handcuffs on him. Hubbard has been charged with driving under a suspended license and resisting arrest. Hubbard was arrested and examined at the Cuyahoga County Jail Euclid Annex. He later posted bond and was released. A family member of the suspect told the station that Hubbard is resting and recovering. The arresting officer was treated at a local hospital and eventually released. The officer has been paid placed on paid administrative leave, WEWS-TV reports. Euclid police said they will review the incident "so that the public can have a full and open understanding of the series of events that eventually led to this violent encounter." "There seems to be some aggression and at no time have we seen de-escalation take place," Michael Nelson, attorney for the Cleveland NAACP, told Cleveland.com. "This particular videotape is disturbing regardless of the underlying circumstances."